Farm cartoons have been a part of my creative cartooning repertoire for many years and I have always enjoyed creating these specialized single panel gag cartoons. From the very beginning when I first started submitting cartoons to various agricultural publications, cartoons about farming were a favorite theme. A few aspects of this publishing genre attracted me and they were varied. Namely, at the time I started freelance cartooning, I learned the trade publishing field had a wide variety of farming and agriculture magazines. Competition with other cartoonists was much less when submitting work to farm magazines because most were trying to get published in the large circulation magazines. Therefore your chances of getting work accepted were far greater, not to mention the fact if you submitted quality written gags that were accompanied with a decently illustrated cartoon, it helped improve your chances. Especially with editors who appreciated your work and liked cartoons to begin with. Across the U.S. there were state associations that all had their own sectors of newspapers, newsletters or actual tabloids devoted to so many different “slants” in farming and the range seemed endless. There were cattle magazines, grain magazines, agronomy science publications, pig farmer newsletters . . .you name it and a publication is devoted to it. So the opportunity of potentially selling cartoons, not to mention building up a regular group of interested editors was a motivating factor. This doesn’t include the potential market that exists in Canada. Where there is a huge industry devoted to agriculture. So many provinces and so many aspects devoted to farming and cattle production that lead to publishing. I enjoy drawing animals so it seems a perfect fit that I devote my time to this slant and provide the types of cartoons that I think might interest editors. This is not to mention the potential that’s out there for a cartoonist to build up a sizable stable (pun intended) of personal markets with which you can work with. Once you acquire an editor who is interested in your material, you can nurture that editor’s needs and fill that niche with the type of cartoons they are seeking and do it on a monthly basis. Continue to study that slant and write material you feel will appeal to the editor or their readership or in fact, both. 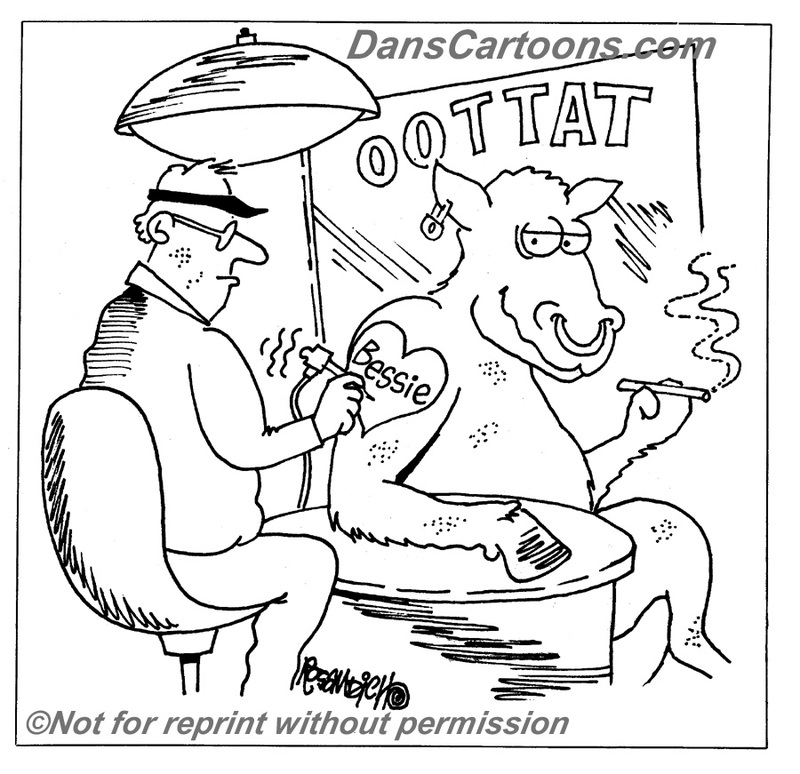 I’m including a few samples of previously published cartoons to give an overview of the typical kinds of comics that editors at farm and agricultural publications will typically use. At certain points in time, when I was circulating these kinds of cartoon panels to publications, I had roughly 800 farm cartoons in motion. Big publishers like Farm Progress Publishing had produced a magazine for each state in the country or at the very least a majority of the states. There is Michigan Farmer, Illinois Farmer, Wisconsin Farmer and the list goes on and on. Years ago each state related publication had it’s own editor and a cartoonist could submit work accordingly, sending work to that specific editorial office and address. Years ago Farm Progress had consolidated all of it’s publishing efforts to obviously save money as the internet began to impact the farm and agricultural publishing field and no longer required freelancers to submit to each separate editor or editorial address. This is just one example of the changes that have taken place in the publishing business related to agriculture. If you devote enough time to creating cartoons for the farm slant, you should also offer your services to create custom farm cartoons since many editors can no doubt use your work to make a point with editorial features they may be writing or the cartoons could also be used to accompany a regular written feature. Don’t hesitate to show samples of your editorial cartooning abilities since I’ve acquired editors who have called me each month to do a special cartoon or editorial cartoon to help them make a point. He or she would call and discuss a concept they have in mind and I would jot down notes based on this concept. Later, a rough sketch would then be faxed or emailed as an attachment and we would discuss the overall appearance of the artwork and make any specific changes or alterations the editor indicates and a final cartoon is eventually approved. The work is then sent as a high resolution image file after being formatted in Photoshop. In the days before the popularity of the internet, I’d fax work back and forth and ship the original art via Federal Express which the publisher would receive the next business day. Computers and the internet have alleviated all of this and in fact speed up the process ten fold. Some of the cartoons I’ve created for the farm and agricultural business have appeared in magazines with mastheads that may sound familiar and others no so familiar sounding. Publications like The Furrow, Farm Journal, Farm Focus, Western Producer, The Cattleman, Michigan Farmer, Illinois Farmer, Wisconsin Agriculturalist, Crops & Soils, Farm & Ranch Living, Hoard’s Dairyman and Country magazine have published my cartoons and new markets for cartoons continually are launched. These new publications are potential users of cartoon humor and readers of these publications no doubt have a sense of humor and appreciate what is funny in the ag business. Anyone working in agriculture has got to have a sense of humor, because if you really think about it, what would those people be like without humor or the ability to appreciate a good cartoon? Can you imagine a work ethic like farming and have it void of any kind of humor or sense of what’s funny? 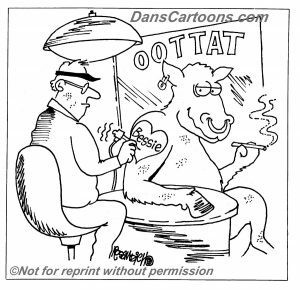 Users of farm cartoons can also become regular clients and all of the previously mentioned publications became regular clients who always reviewed cartoon submission when I’d submit work to them. 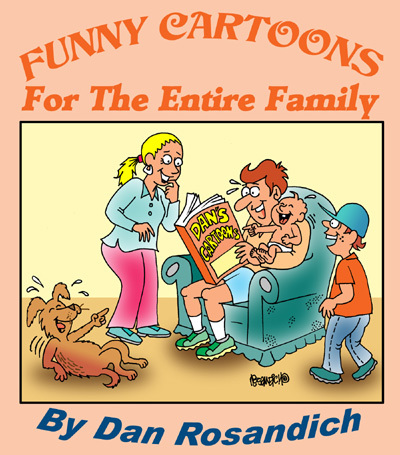 Another factor to consider is even though they may not be interested in actually publishing single panel gag cartoons, their format and layout may be such that space is at a premium and devoted only to display and classified advertising. It’s sometime the nature of the beast. However, they may acquire your services to illustrate their advertising or direct mail. The savvy cartoonist will be the one with a combination of marketing skills and illustration abilities. That artist will also possess promotional know-how and the abilities of using technology to his or her advantage. Learn web design and try to find decent software to help you build a decent online portfolio. The potential is limitless when you look at the big picture. You need to realize you shouldn’t limit yourself since there is no boss to oversee you except yourself!